Valves are highly arched. 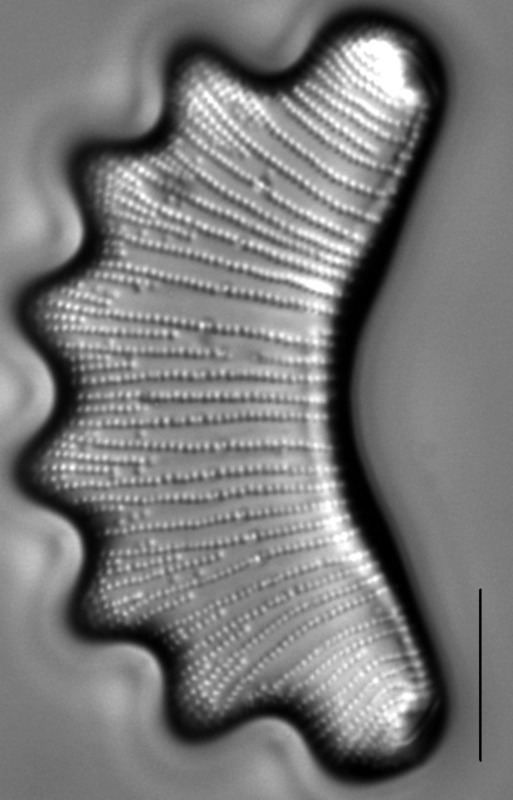 The dorsal margin has a constant 6 bluntly pointed undulations. The ventral margin is concave and follows the same curvature as the dorsal margin. The apices are wider than the undulations and obtusely rounded. 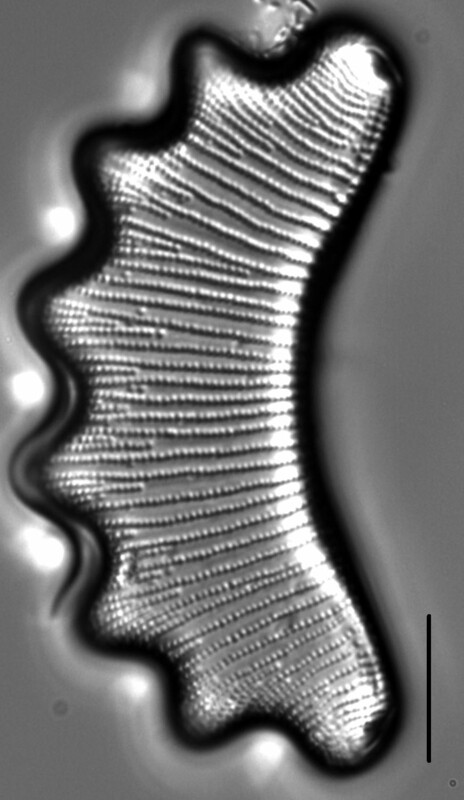 Apices are set off from (never coalesce with) the terminal undulations, even in smaller specimens. Distal raphe ends lie along the valve face very close and parallel to each end. Striae are radiate throughout and of two types: complete striae that extend the full width of the valve and short striae that occur only along the dorsal margin. 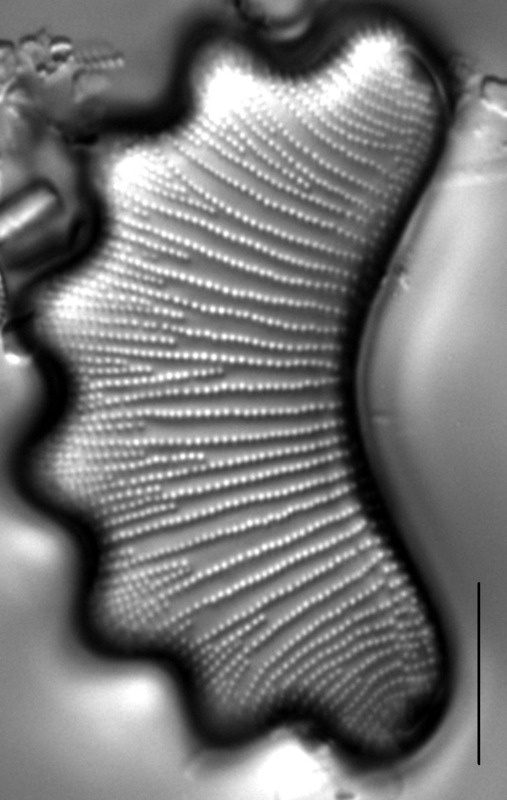 Fan-shaped packets of short striae fill the gaps between complete striae within each undulation. 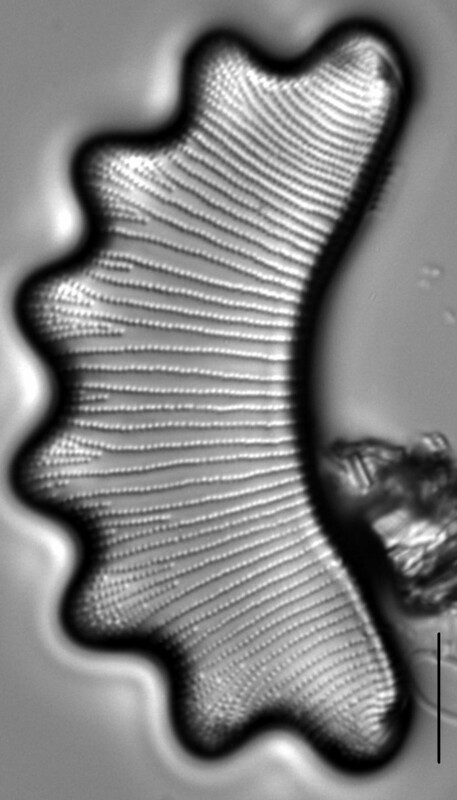 A fine transparent line runs close and parallel to the ventral margin. Striae on either side of this line may be continuous or displaced. 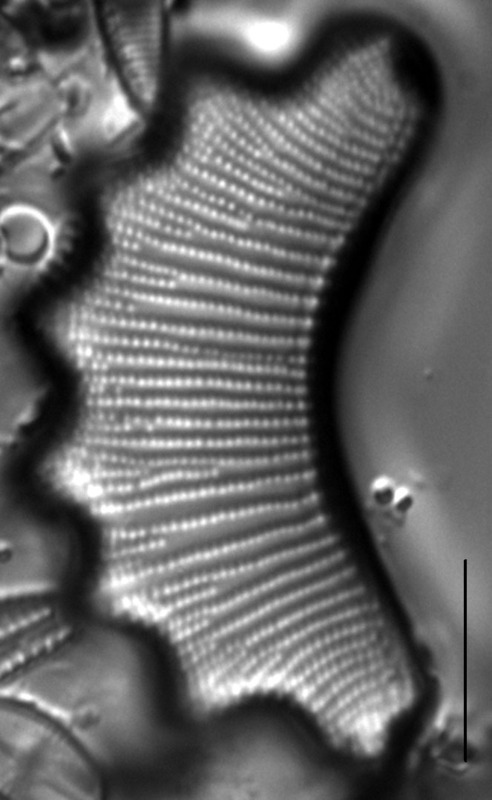 Areolae in the striae are easily resolved in LM and number 20-23 (mostly 22) in 10 µm. The specific epithet diadema is the Latin word for "crown". 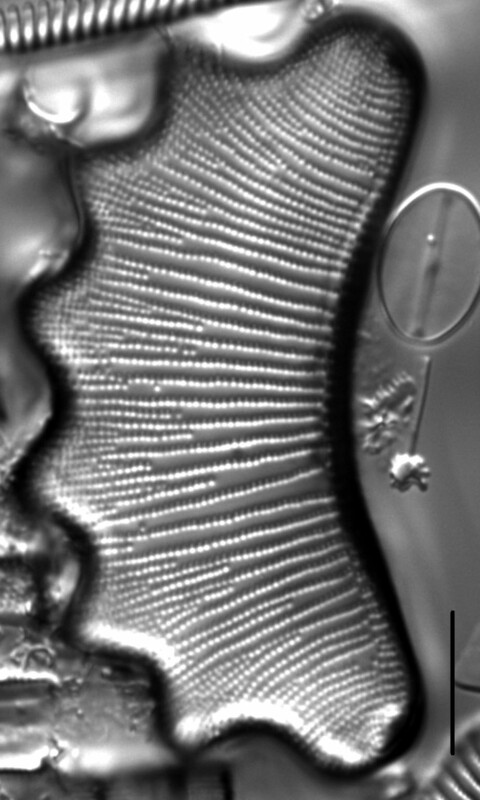 In the Montana Diatom Collection, Eunotia diadema occurs in fens, ponds and small lakes, primarily in the Idaho Batholith and Canadian Rockies ecoregions of western Montana. These waters typically have circumneutral to somewhat acidic pH and low conductivity. Patrick & Reimer (1966) combine this taxon with Eunotia tetraodon and report them as occurring in oligotrophic or dystrophic swamps and bogs in the New England states and Utah. 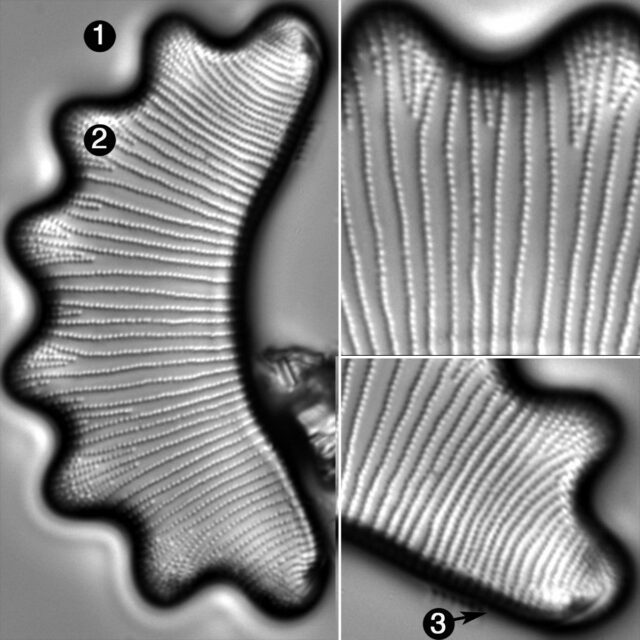 Lange-Bertalot et al. (2011) report it as a component of the Holarctic flora where it is associated with other acidophilous diatoms. 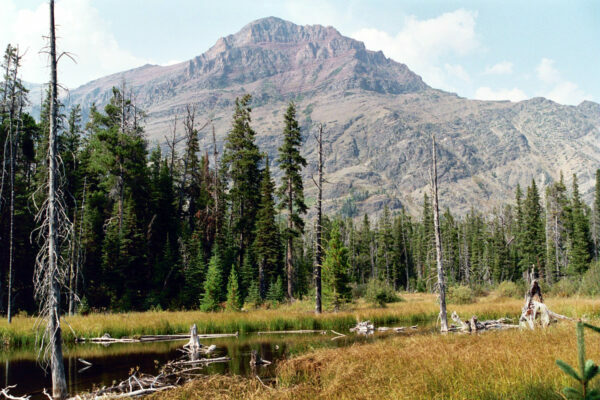 Paradise Pond, Glacier National Park, Montana: home of Eunotia diadema. 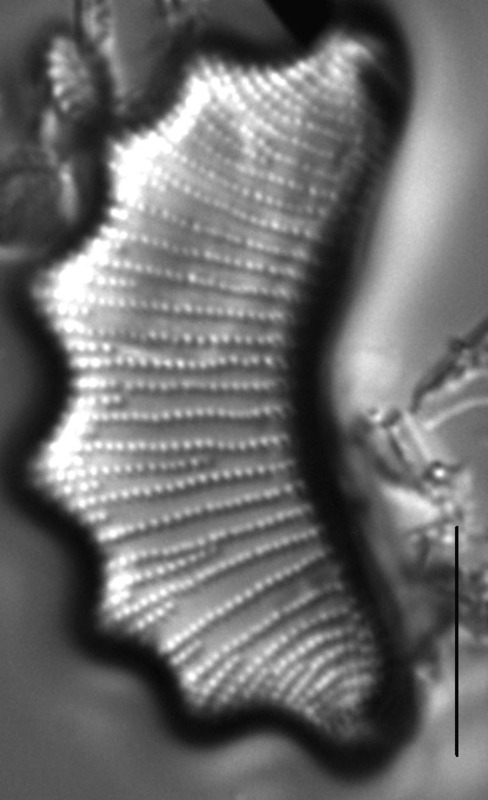 Eunotia diadema has large valves with highly arched dorsal and ventral margins. The dorsal margin has a constant 6 undulations. Apices are broad and obtusely rounded.